It won’t hurt your wallet as badly as you might expect. 1. Know your transportation options. Transportation in Japan is no joke—it will easily eat a large portion of your budget if you don’t make smart decisions. If you’re staying in a city for the most part, metro tickets cost around ¥200 or P95 per ride. They also have a day pass, which will give you unlimited trips for 24 hours. Everyone wants to try the bullet train—and we can’t blame you—but if you want to make this trip as affordable as possible, it’s best to skip it first. If you’ll be in Japan for longer than just an extended weekend, however, consider investing in a Japan Rail (JR) pass (¥38,000 or P18,000 for seven days). 2. Go for hostels and capsule hotels. Cost of living in Japan is incredibly high, and backpacker-friendly accommodations aren't exempted. You'll probably never find a place that's dirt cheap, but hostels and capsule hotels are popping up everywhere, and you should take advantage! They may not be as cheap as the dormitory-style places you'll find in Cambodia, but they're also kept in pristine condition. You'll definitely get your money's worth. According to Lonely Planet, "prices range from ¥3,500 (P1,700) to ¥5,000 (P2,400), which usually includes access to a large shared bath and sauna." A dorm, on average, will charge ¥2,800 or P1,350. And if you really want to save more money, Japan has manga cafes with private cubes, showers, and vending machines with real food. You can stay there for 12 hours, and it's only ¥1,500 or P800. 3. Be your own tour guide. 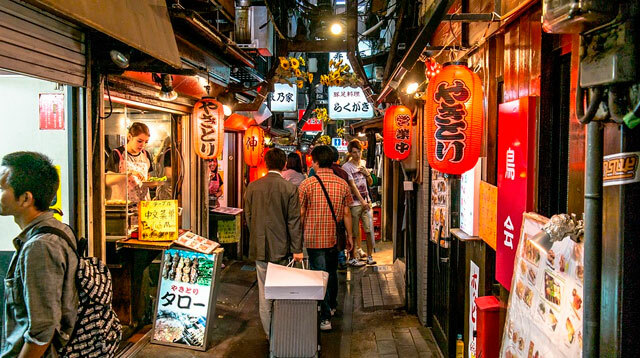 With months of preparation and enough research, you won't have to book an agency to give you a tour of Japan's top attractions. In fact, a lot of Japan's temples and parks don't have entrance fees. A museum might charge ¥500, which is around P250 only. In Kyoto, you can buy the Kansai Grutto Pass for ¥1,000 (less than P500), and you'll have access to more than 50 museums and galleries in the Kansai region. 4. Hit up grocery stores and "button" restaurants. You don't have to go to Jiro's place to be a foodie in Japan, because even their street food is PREMIUM. In grocery and convenience stores, the sushi is always freshly made, 'cause, you know, standards. They also have teriyaki and tempura there! These can cost P300 at most. And toward the end of the night, they go on sale, so watch out for that as well. ;) If you don't know what "button" restaurants are, it is where you push a button to order a meal, and you give the receipt to the cook. These meals are usually around ¥400 (P190), but at least you won't have to worry about the language barrier (yes, there is one). Another thing that'll help you skimp on your meals is the "sushi train" or conveyor belt sushi. ¥150 per plate? That's only P70!